Midway through his 45 minute set, Rakim held a hand in the air, rubbed his fingers together, and asked the crowd to do the same. He pondered aloud how this gesture may have been history's first piece of sign language. This clever moment was how the "God MC" introduced his hit "Paid In Full." Although his current tour lacked an appearance from his legendary DJ and the other half of Eric B. 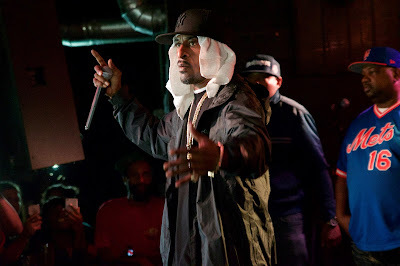 & Rakim, this outing still felt special. The New York icon walked onto the stage just after midnight, draped in gold jewelry -- chains, bracelets, and a pinky ring -- with a pristine pair of Timberlands on his feet and a towel tucked under his black Yankees fitted. Cell phone lights bounced off him as he gripped the mic and jumped into a set that was as graceful as it was powerful. Rakim treated fans to a set that included singles from his classic Eric B. collaborations, as well as smart cuts from his solo catalog. Most golden era hip-hop fans could bask for days in gritty, in-your-face banter from their favorite rappers, but Rakim went the extra mile beyond putting on a show to prove to his audience that he cares about the art form. He spoke for a couple minutes near his set's end about the times he's cherished the music with his grandchildren and how he's watched hip-hop grow from its infancy to become the world's most influential genre. Those who know Stik Figa know he shares a similar passion for hip-hop. The Topeka emcee's opening set included several tracks from his most recent record, "Central Standard Time," and evoked warm smiles and applause from a crowd that was mainly unfamiliar with him. Stik's talent for intelligent wordplay fit the bill perfectly.